Easy to read, easy to use, and hard to beat, this comprehensive tax-saving guide has become the go-to resource for tax professionals and home filers alike. Unlike other brand-name guides, the book focuses on tax saving, not tax preparation—zeroing in on the one thing you really care about: paying less to the IRS. 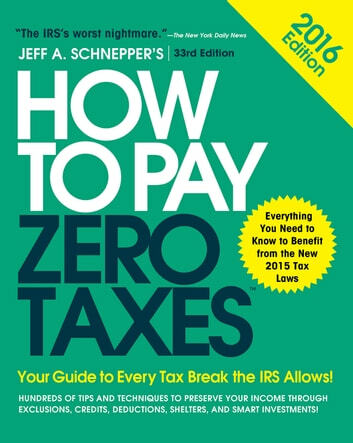 Tax expert Jeff Schnepper explains everything you need to know in simple, accessible terms, organizing important subjects like deductions, exemptions, and tax shelters into six simple sections. The book includes the most up-to-date information—and hundreds of insider tips—that can lower your tax bills, and save you a bundle, year after year. Jeff A. Schnepper, Esq. 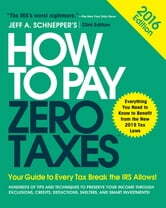 (Cherry Hill, NJ) is the author of multiple books on finance and taxation, including all previous editions of How to Pay Zero Taxes. He is a financial, tax, and legal advisor for Estate Planning of Delaware Valley and operates a tax, accounting, and legal practice in Cherry Hill, NJ. Mr. Schnepper is Microsoft’s MSN MONEY tax expert, economic editor for USA Today, and tax counsel for Haran, Watson & Company.